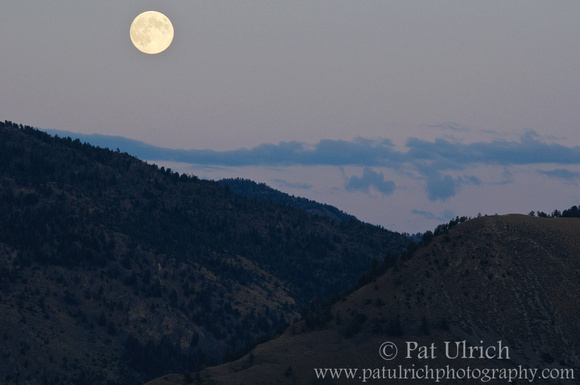 A full moon rises over the foothills in northern Yellowstone National Park on our last evening in the park during our September trip. Prior to taking this shot we had been watching a small group of male pronghorn feeding in the fading daylight on the gravel road through the plains near Gardiner. After the sun had dropped below the horizon in the west, we began our trip out of the park for the night, and were greeted by the rising full moon while the rest of the landscape was still in the pastel colors of twilight. View more of my landscape photography in my Landscapes Galleries. Outstanding. There is to be a lunar eclipse here (west coast) on Dec. 10 at 3:35am to 7:20am when the moon sets. Totality at 6am and I hope to be up and ready for it. The last time my pictures were oh-hum, so hope to be better this time. amazing photograph; to get that full moon during twilight; great opportunity. Super shot, Pat. Must have been so moving to see out of doors in the crisp air. I must have just missed you. It was still a full moon when I got to Yellowstone. I think it was September 11.